Free Practice: In the first free practice it was really busy on track with 38 cars running. All Kaufmann Drivers did a really good job and were fast upto speed. In the end we saw the Rookie Dennis Olsen beeing impressively on P4. 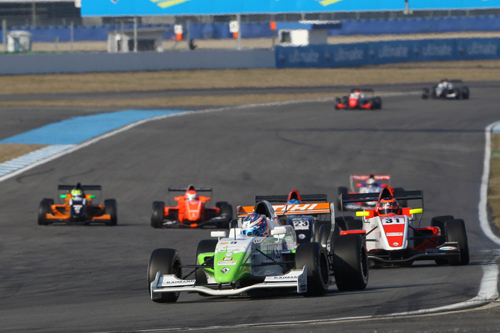 Gustav Malja was P7 and Steijn Schothorst P9. In the second free practice the Kaufmann Drivers safed a set of new tyres, so respectively they were pretty much down the order with Malja on P15, Schothorst P18 and Olsen P21. Qualifying: In the Qualfying which was split into two groups, it was Gustav Malja and Dennis Olsen in Group 1. Malja was P3 and P2 in his Group and Olsen two times P6. In Group 2 it was Steijn Schothorst qulifying two times P5 in his group. 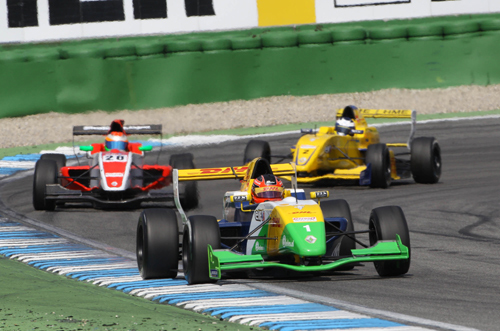 For Race 1 the Grid was: Malja P6, Schothorst P9 and Olsen P12. For Race 2 the Grid was: Malja P4, Schothorst P9 and Olsen P 12. Race 1: Gustav Malja missed the start and had a difficult opening lap dropping back out of top ten. Steijn Schothorst had a ggod start and moved up to P8. Dennis Olsen improved himself to P 11 in the opening lap. After the half of the race distance a bad crash caused Safety Car and the race was finished behind the Safety Car. Schothorst finished P8 infront of Teammate Malja on P9. 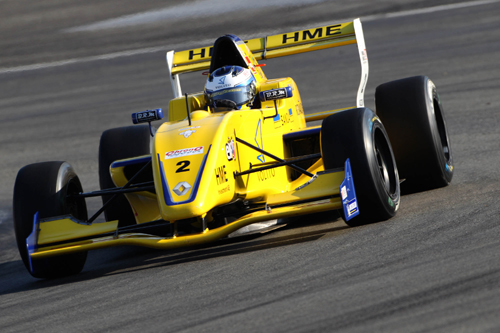 Dennis Olsen finished his first ever Renault race on P 11. Race 2: On Sunday morning the track was a bit damp and temperatures were really low. Malja again missed the start and lost few positions back to P 7. Schothorst as well, after having a little contact and lost part of his front wing dropped back to P10. Dennis Olsen also dropped back as he really drove carefully with the difficult weather conditions, which once more caused a Safety Car scene during the race. In the end Malja finished P7, Schothorst P10 and Olsen P16. Race 3: As the starting grid of Race 3 beeing determind by the result of Race 1, Schothorst started P8, Malja P9 and Olsen P11. During a very good opening sequence of the race, both, Schothorst and Malja were able to fight their way up the standings. Schothorst moved up to P5 and Malja up to P7. Olsen was able to keep his position and was running on P11. After a good race without any more overtaking action the Kaufmann Drivers finished P5 - Schothorst, P7 - Malja and P11 - Olsen.